Just how many do you know? Probably thousands. 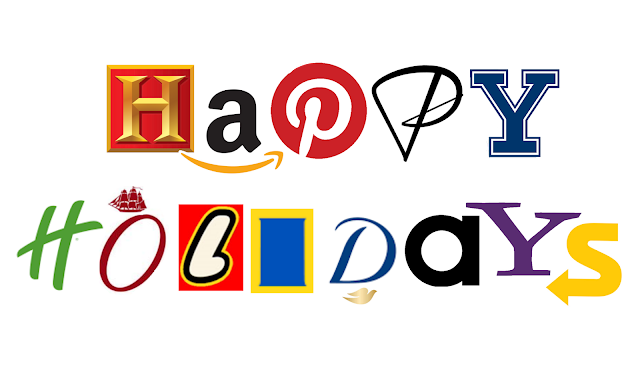 Recently, SRS Regular Reader Jacob sent me this wonderful holiday card he received that was made up entirely of logos. Designed by Marc Reiner, it's a gem of a card design. I recognized a bunch of logos immediately (Pintrest, Amazon, etc.) -- but can you name them all? I couldn't. This card reminds me that being able to identify the parts of a larger ensemble can be a valuable skill to have. 1. Can you identify all of the logos shown here? What are they? 2. If you wanted to search just for logos, is there a way to do just that? How about just searching for logos in the EU? As always, let us know how you did it. Share your expertise with all of the SRS readers! Answer: What are paintings of things that are NOT the things they depict? I've seen paintings like this ever since I took Art History as an undergraduate. You know what they are--paintings of things that are NOT the things they depict. 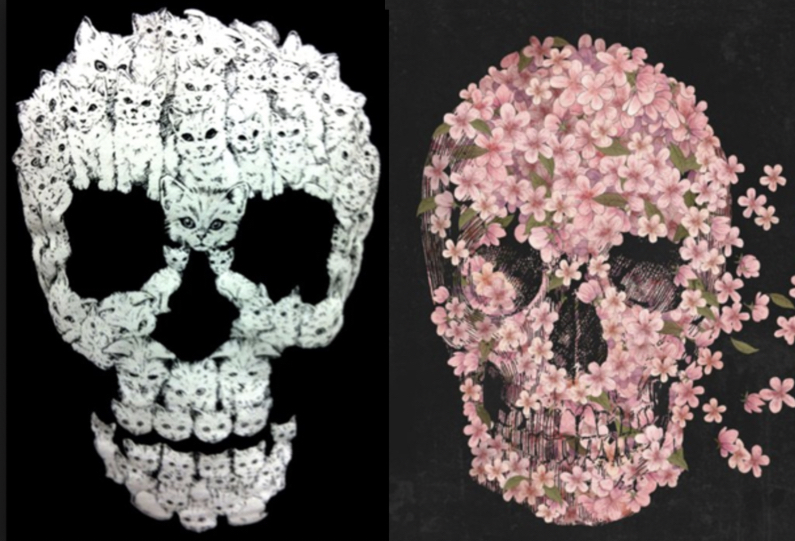 As you can see in the examples below, the skulls are made of cats or flowers, and the portraits are made-up of fruits, flowers, and vegetables. What are these kind of paintings called? (As you know, if you have a specific term for something, it's a lot simpler to search for information.) Is there a specific term? In the spirit of our recent direction on getting "the rest of the story," can you figure out WHY these paintings became popular? Or can you find artists who are famous for making these "paintings of not-the-thing"? 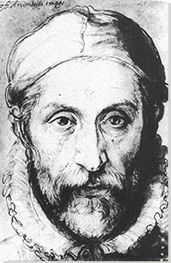 which quickly led to the Renaissance painter Giuseppe Arcimbolo. Mashable article by Alex Q. Arbuckle which has several beautiful high-resolution images, including a few that are NOT made of fruit or veggies, but which feature other objects (including this amazing portrait that's made up out of many kinds of sea creatures). 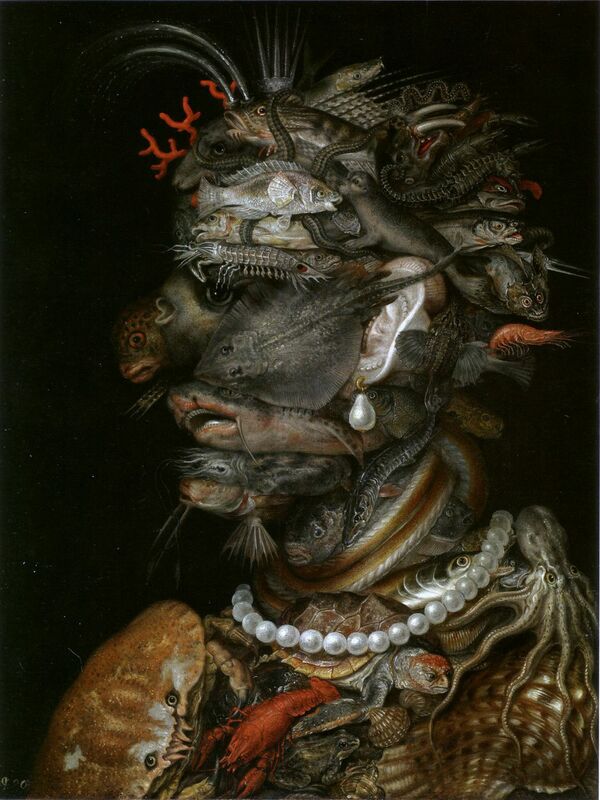 This is "Water," (1566) one of a set of four portraits depicting the four different elements. This is made up of fish and other things from the sea in a wild composition that is much like his more wild images. While this is a gorgeous article (be sure to click on the Mashable link above and see the images in full-screen), I naturally wanted some other information on Arcimbolo to triangulate and corroborate what I found (and maybe, along the way, pick up what this kind of artwork might be called). But our deeper question is "what is this kind of art called?" As you know, if you have a specific term for something, it's often a LOT easier to find more-of-this-kind. In earlier SRS posts we learned that specific biological terms (e.g., Sequoia sempervirens) is what you want for very focus searching. So, I was hoping to find an art history term (along the lines of cubist, surrealism, or Pre-Raphaelite). But I was hoping for something more generic that would describe ALL paintings made in this style. 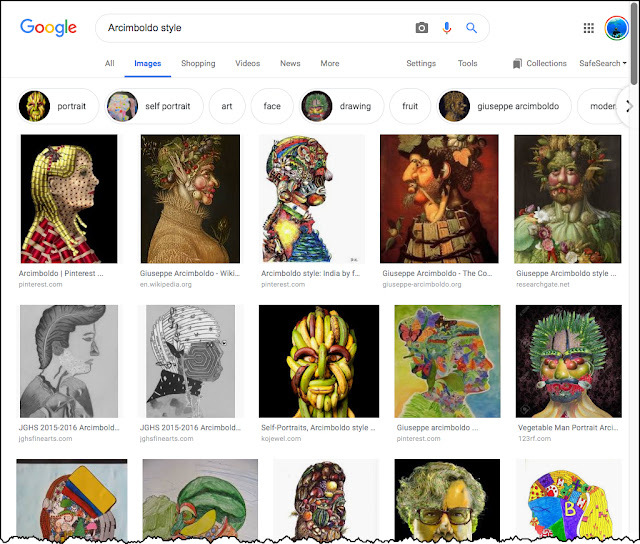 This has a lot of suggestions at the top (and many more interesting images below that are done in Arcimboldo's style). But none of those suggestions are leading to a specific term. This works surprisingly well find art-in-the-style of Arcimboldo, but it doesn't get us to a specific term. And that's maybe just the way it is: Maybe there ISN'T a term for "paintings made of composites of fruit or veggies." I suspect that Arcimboldo defines this space much as Rembrandtesque defines a particular style of Dutch Master painting. Riffing off Arthur's idea I took this one step farther and went to the OneLook Reverse Dictionary (by doing the query [ reverse dictionary ]). Then I did a * search like this to see all of the words in English that end in -esque. (I note that you cannot do this in Google.) Here I've put arrows to all of the words that are adjectives describing particular painters (Rubens, Dali, Michelangelo, etc.). 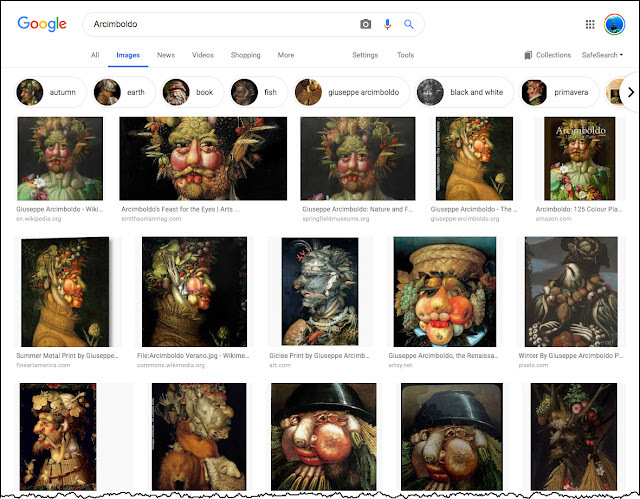 Alas, Arcimboldo isn't among them as an "official" term, but it clearly works as an informal construction. But we found that a decent answer to our Challenge is "...they're Arcimboldoesque paintings!" 1. Not everything that you want to exist actually exists! I really want a specific term for this kind of artwork, but it's not a thing. 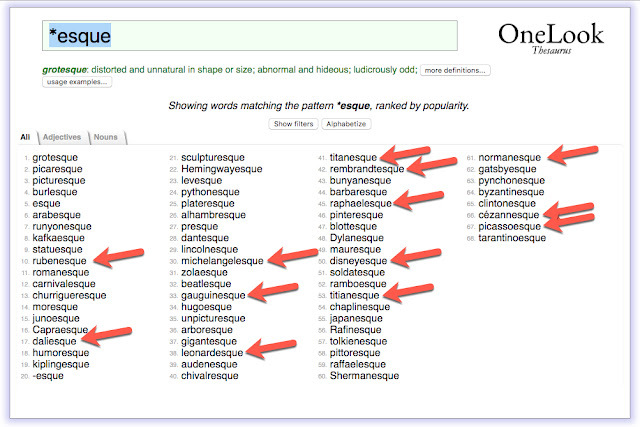 Luckily, people seem to create new words ("Arcimboldoesque") as needed. That's a good thing, as it lets us find things that are otherwise hidden. 2. There are tools to help with partial-word matches! There are several tools that exist for doing partial-word matches (such as the one I did above with the * on One Look). If you work with words much (and you do! ), it's worth learning more about these tools so you can use them in your advanced searching. P.S. Sorry about the long delay this week. I was traveling, which normally doesn't slow me down... but my laptop BROKE on day 2 of my weeklong trip, and I was without any way to write the blog! Drat. First time that's happened. Look for a new Challenge tomorrow. 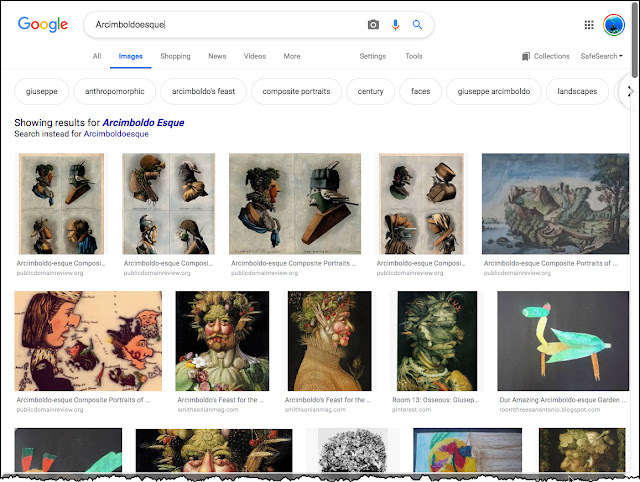 SearchResearch Challenge (3/27/19): What are paintings of things that are NOT the things they depict? First... My article on “The Skills of Online Search and Research: Why research skills matter more than ever in the age of the search engine” JUST appeared in the online Scientific American (March 26, 2019). It won't tell you (the regular SRS reader) anything particularly new, but it will come as a bit of surprise to non-SRS folks. Send the link to your friends, and if they're interested, remind them how to sign up for our SearchResearch group (just visit the Google Group sign-up page and click on the blue button that says "Apply to Join Group" and they'll get the once-weekly emails from SRS). Second... I got the galleys of my book last week and have been busy marking it up in prep for publishing. This is the last step before sending it out for printing. Another hurrah! My publisher (MIT Press) also made an Amazon ordering entry for The Joy of Search, although it's just a stub at this point. Still, it's an encouraging sign. Last week's Challenge turned out to be incredibly hard (at least for me, in Palo Alto, California). It was easy to figure out who picked up the trash and recycling, and it was easy to figure out where it goes, but it's incredibly hard to figure out where the plastic goes AFTER it hits the recycling center. Since last week was so tricky, this week will be much easier, and mostly for fun! Can you figure this out? Let us know how your research goes! Answer: Where does your recycling go... really?? I bet you're wondering what happened. When I started, I wasn't sure if this would be easy or difficult...It's not obvious where you'd begin searching for this information. Luckily, for me at least, finding out where my trash and recycling goes is fairly straightforward. So I thought this would be about a 30 minute search. And it was. Trash and Recycling pickup in Palo Alto. Where does YOUR recycling go? How much of the stuff you carefully put into the recycling bins actually makes it into a recycled product vs. into a landfill? To do this efficiently I opened up TWO different browser windows. 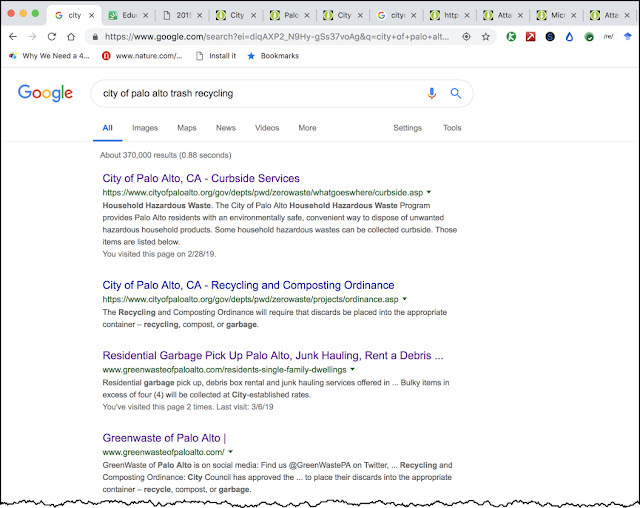 One is for my searches having to do with Greenwaste, and the other having to do with things I find from the City of Palo Alto. At the bottom you can see the link to Greenwasteofpaloalto.com -- that's the link I opened in the second browser window. Basically, each of my two browser windows are on a specific topic--the first one is all about recycling in Palo Alto, while the second one is all about GreenWaste, the company. But naturally, as you search, new topics become relevant at different phases of your research. I usually use different windows to group related topics together. 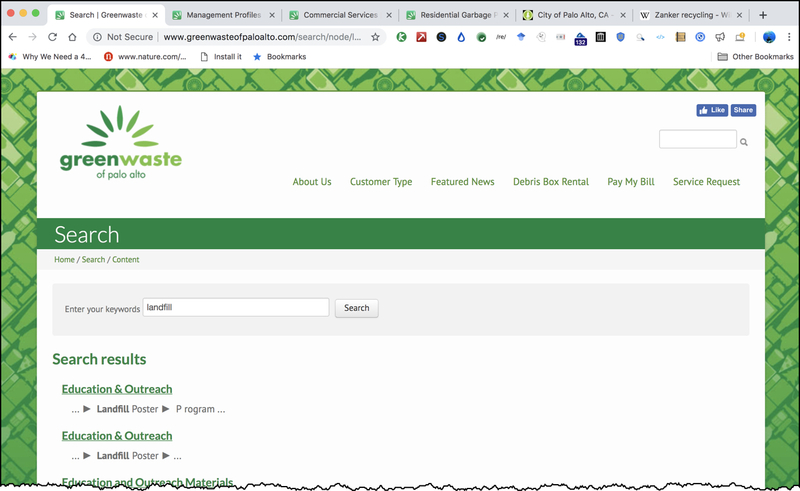 Notice that I found a link on the Greenwaste site that pointed back to the City's website (the second tab from the right side.) That's a link to the City's "Zero Waste" program which is useful because that page connected me with the City's 2018 Zero Waste Plan! 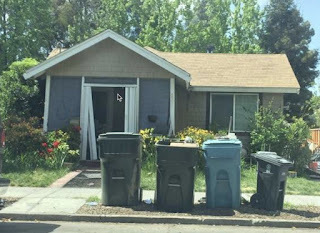 "...contracts with GreenWaste of Palo Alto, Inc. (GreenWaste) to provide comprehensive recycling and organics collection to all residential and commercial customers in Palo Alto... recyclable materials are processed at the GreenWaste Material Recovery Facility where commodities are segregated and sold to domestic and international markets. Organic materials are processed at the Zero Waste Energy Development Corporation anaerobic digestion facility which produces renewable energy to operate the facility. Excess energy produced at the facility is sold to the power grid. The materials leftover from the digestion process are further composted at the Z-Best compost facility. 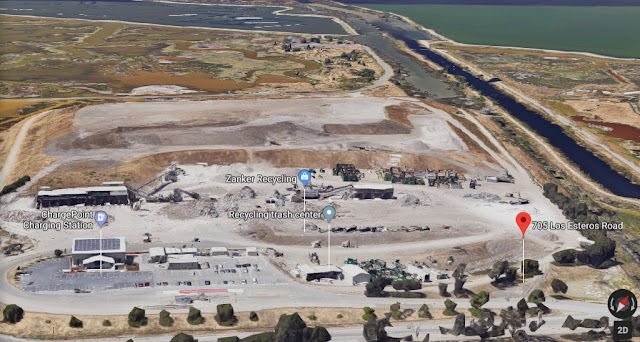 The City also partners with the cities of Mountain View and Sunnyvale on the Sunnyvale Materials Recovery and Transfer Station (SMaRT Station). 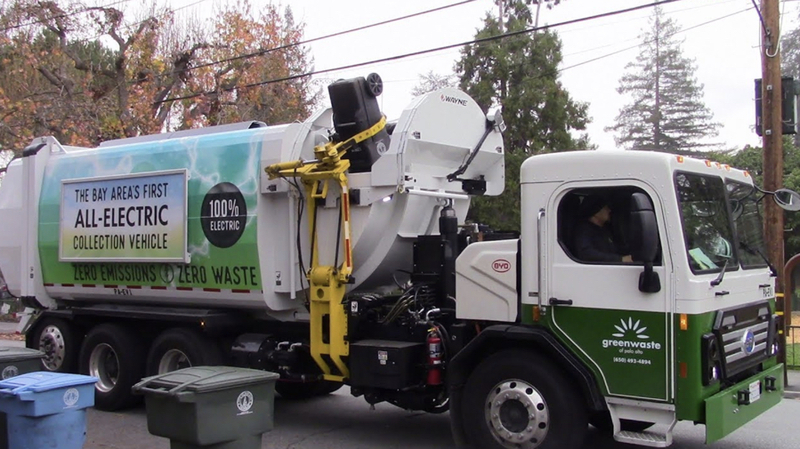 The SMaRT Station processes mixed garbage from Palo Alto and recovers recyclable and compostable materials that would have otherwise gone to landfill." However, this notes that the City has "...contracts with GreenWaste, the Sunnyvale Materials Recovery Station (SMaRT), and Waste Management (Kirby Canyon Landfill) all expire in the Fall of 2021." This is getting a little confusing. When I start to get too much information, I start making lists and drawing out diagrams to keep things clear in my mind. 1. GreenwasteOfPaloAlto the company; 2765 Lafayette St., Santa Clara, CA) runs the trucks and staff that picks up everything and delivers it to one of..
4. Z-Best compost facility (ZBCF) - is for clearly compostable materials. 980 State Highway 25, Gilroy, CA. Yet another question--what's the difference between ZWEDC and Z-Best (aside from location)? How do "digestables" differ from "compostables"? Seems like most of ZBCF's input comes from ZWEDC. Are there a line of trucks going from ZWEDC to ZBCF? 5. Zanker Material Processing Facility (ZMPF) - 675 Los Esteros Road, San Jose, CA (next door to the ZWEDC). They separate the materials that come in. 6. Sunnyvale Materials Recovery and Transfer Station (SMaRT)-- which ALSO sorts out recyclable materials and compostables. But the staff report I found on the City's website says that the SMaRT station only takes garbage materials. But isn't that what the Greenwaste Material Recovery Facility (MRF) does? The plan says "The SMaRT Station processes mixed garbage from Palo Alto and recovers recyclable and compostable materials that would have otherwise gone to landfill." Like what? Does GreenWaste (the folks who pick up our trash) actually deliver to the SMaRT station, or does it all go to the GreenWaste MRF? 7. Zanker Road Recycling (aka Zanker Road Landfill) 705 Los Esteros Rd, San Jose, CA. This is the Zanker landfill site, run by GreenWaste. Most of the GreenWaste unrecyclable trash ends up here. From the trash stream they get, they extract more organics to make compost, mulches, soil amendments, and even aggregates (base rock, sand, drain rock) from the stuff we send them. You can see the landfill pile behind the recycling center. 8. 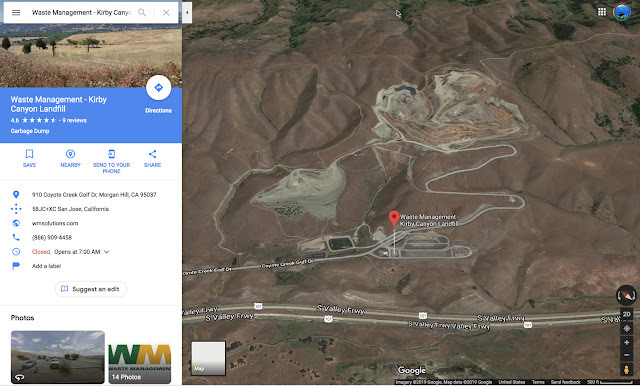 Kirby Canyon Landfill. 910 Coyote Creek Golf Drive, Morgan Hill, CA Operated by Waste Management Solutions Inc., they run a set of 12 different landfills in California (and more across the country). Kirby Canyon is the place where the non-recyclable and non-compostable trash ends up. Kirby Canyon Landfill way south of Palo Alto, near Morgan Hill, CA. So... we have 8 players here. And as you see, I have more questions now that when I started. I have a lot of new questions, so I'm going to pick one and focus on that: Where do the plastic (recyclable) bottles go? The bottom line here is that collecting this information took me a LONG time. So far, I've probably spent 9 hours on this Challenge. Why is it so complicated? Largely because the websites are incredibly messy. There's an convoluted corporate structure (see all of the Zanker sites above) and conflicting reports about who does what. I'm a pretty compulsive and careful notetaker, but after I filled up two large browser windows and several sheets of paper, it's still a mess! There's also a huge problem with out-of-date information (old websites that are still active, but are years out of date... but their last update date information isn't really obvious). There are also lots of not-yet-updated city content (e.g., the City of Palo Alto, which has a lot more information than they haven't updated in quite a while). What's a SearchResearcher to do in a situation like this? A: Keep track of as much as possible, and when it gets too complicated, you need to start acting like an investigative reporter. I have my browser windows and a large Google Doc with links pointing to everything. But to help me organize all of this stuff I use a few sheets of paper with notes, boxes, arrows, and numbers. 1. When online research gets too complicated, you've got to start doing the offline research quest. Take notes, write down names, places, and contracts. Follow the money. Phone calls coming up! Stay tuned. This isn't over yet. I've just begun! ... where DOES the trash go??? I was writing up my solution about the trash / recycling question. I'd read lots of documents, tons of tales, reads of city reports, and was just about to hit publish. I found four different places where the recycling goes and where the trash ends up. I realized that 3 out of the 4 made sense, but I couldn't understand the fourth destination. What went there? As I was writing, I got stuck with a simple question: What DOES that fourth trash/recycling site take in? I know it's a real place (I've actually gone on runs past the place), and I know it's for recycling... but does any of MY trash go there? It's got a contract with my city, it's close to the city, but I couldn't tell. I did not know what to write. I'd been working on this for a few hours, carefully documenting my research, but as I went back over my documents, I could NOT find the answer. Huh. ... I ran out of time to finish my writeup this week. I'll have time next week, so stay tuned for my update post early next week. I'll tell you what I did, how I noticed the problem, and what I did to get around it. I admit that I thought this would be a fairly simple story. 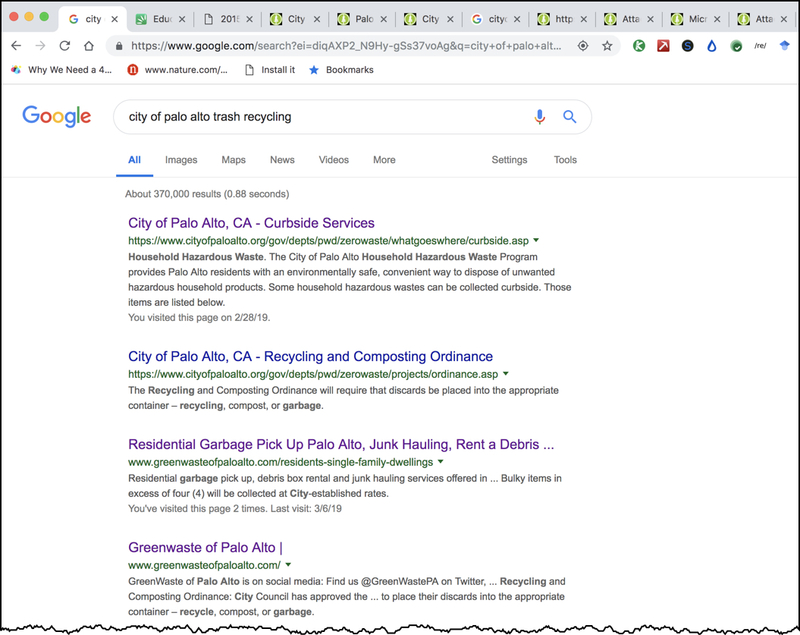 SearchResearch Challenge (2/27/19): Where does your recycling go... really?? Where does your recycling go... really?? A recent spate of stories about how lots of supposedly recycled stuff actually ends up in the trash (NPR story; NERC story; Wired story) made me start wondering about where my trash and recycling really REALLY goes. .... and.... then... what happens? From an SRS point of view, the question is how can you find out?? It's very possible that the trash/recycling organization has a page about what their practices are, but how do you fact-check what they say? How do you really know?? I'm curious about what happens where you live. How much of our "recycling" actually ends up being recycled (as opposed to being put into a landfill or being burned)? Answer: What's the story... of these ruined buildings? ... as I said, it was a bit of a surprise to discover those old buildings suddenly appearing in my camera's view! As you can see from the image of the round building just above and the video below (link to the YouTube video), there are quite a few buildings up this remote Napa canyon. They're just past the stone gates--out of sight from the road, and out of mind of the good people of Napa. As you watch the video you see what looks like a long, rectangular building that seems a little like a castle, complete with crenelation. Near to that is a rather large circular building that seems like it was once several stories tall. 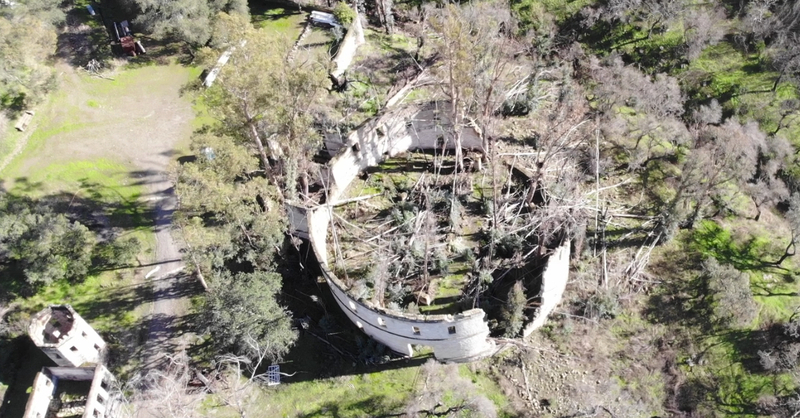 This drone flight posed a mystery for me: What's going on here? Or maybe, what was going on here? What's the story with these buildings? In particular, what's the story of that large, round building? I was impressed with how quickly the SRS Regulars were able to figure this out. As Kate (and others found), a search for [ Napa valley castle] isn't very productive. Turns out there are multiple castles (or castle-like objects) in Napa! So we need something a bit more discriminating. Looking at Images with this query fairly quickly led me to Napa Soda Springs as a place name. 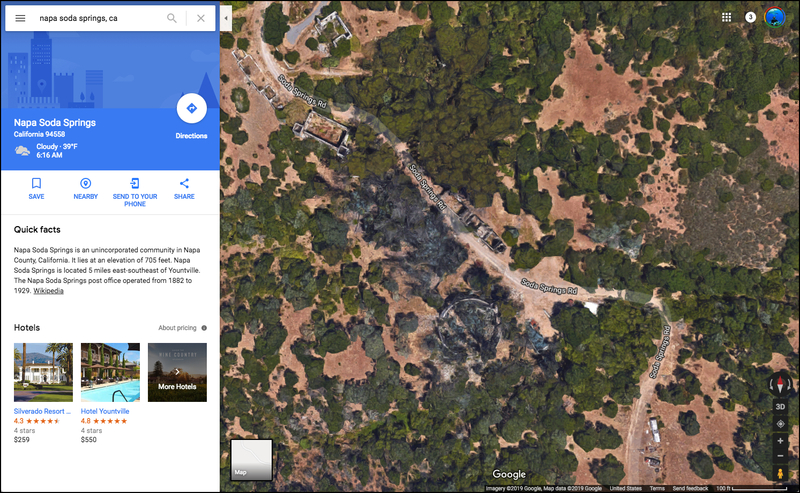 Then, a search on Google Maps for [ Napa Soda Springs ] gave me this image of the grounds... complete with circular building. You can see the circular building in the satellite view of the springs, along with the crenellated buildings. Note also the Wikipedia link to Napa Soda Springs, which tells us that this was ALSO called "Jacksons Napa Soda Springs." In these queries, the terms ruins and history are context terms. That is, extra terms that describe the kind of result you're looking for in the search. 1855, 27 springs of mineral rich cold water were found about seven miles north of Napa City by Amos Buckman. 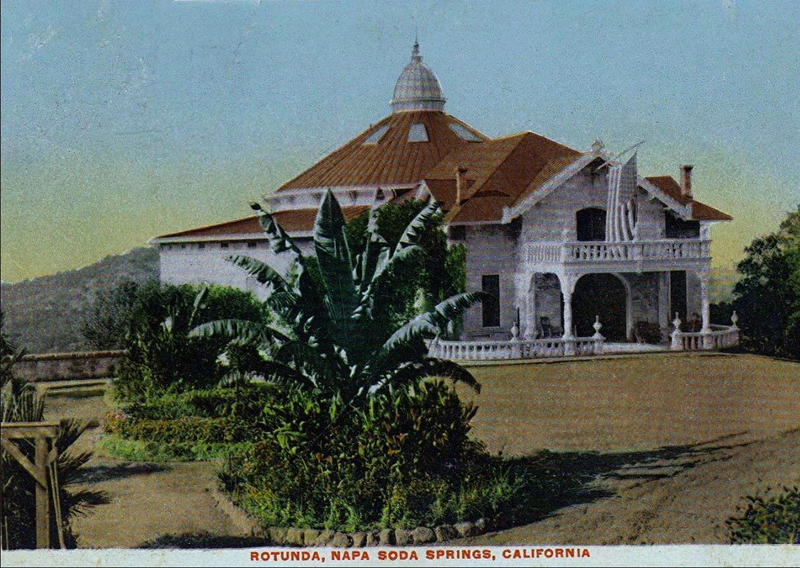 1860, the earliest known ad promoting the water at the spa appeared in the Napa Reporter. The newspaper gave regular updates about the legal battle during 1861. 1861, the newspaper reported that while Buckman was away discussing his case with regional legal authorities, J.H. Wood and companions attacked Mrs. Buckman and workers at the springs, beat them, and destroyed the bottling works. Wood and his associates were each sentenced to a $75 fine or 35 days in jail. 1862, arsonists struck the bottling works operated by Whitney and Wood. Restored to working within a few months. 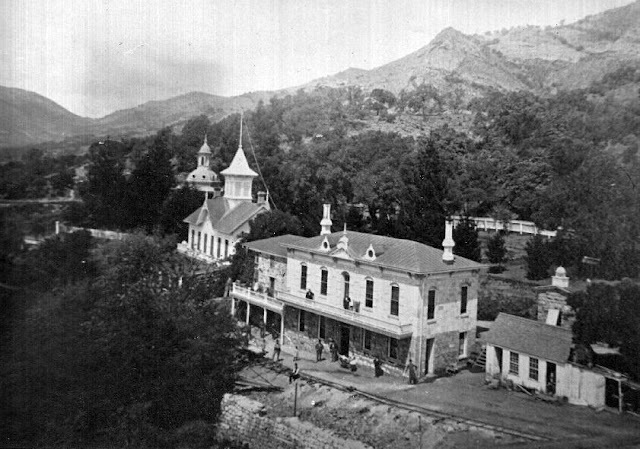 1872, Dr. J. Henry Wood sold the Soda Springs property to Colonel J.P. Jackson for $120,000. 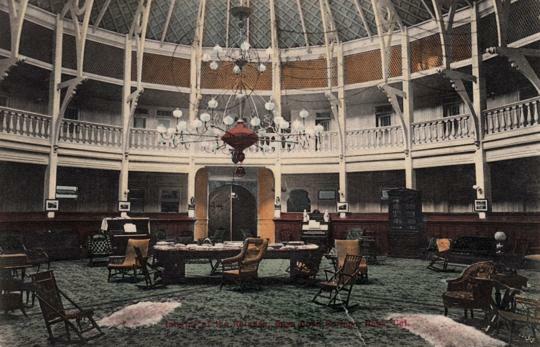 April 21, 1877, the resort introduced the Rotunda, a 75 foot high circular building topped by a glass cupola. There were two stories of outside rooms and a large interior drawing and reading room, lighted from the dome shaped roof by a sixteen foot chandelier. 1881, the resort opened to overnight guests. 1884, many changes and improvements at the springs, including the Tower House, Ivy House, Music Hall, Garden House, clubhouse and pagoda. 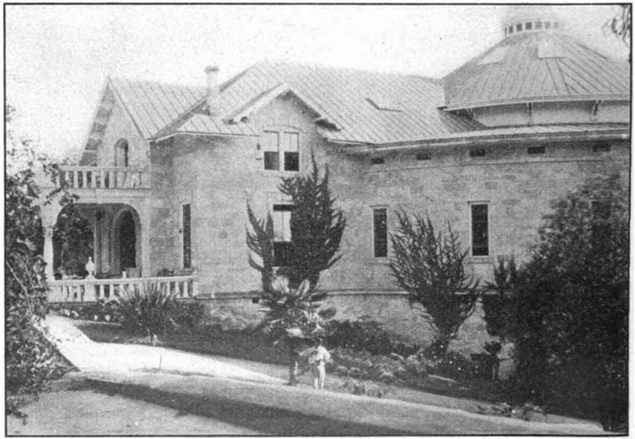 1889, The Register reported that Colonel Jackson’s new residence, Bellevue, was almost done, as was the new swimming pool, 150 by 50 feet, situated just below the lawn tennis courts. September 26, 1900 Colonel Jackson suddenly died, leaving the property to his wife, marking the start of a long, slow decline. In 1914 the First World War, following shortly by Prohibition in 1919 led to the closing of its doors to guests. 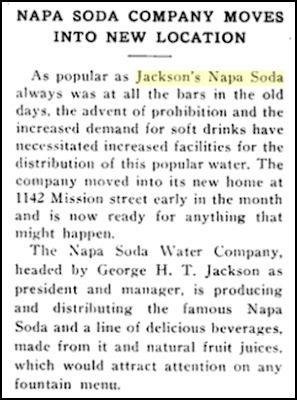 Napa Soda (aka “Jackson’s Napa Soda” after John Jackson bought the place) continued to be sold through the Second World War, mostly through its outlet in San Francisco. The site itself was burned in an arson fire (again!) in the early 1960s. 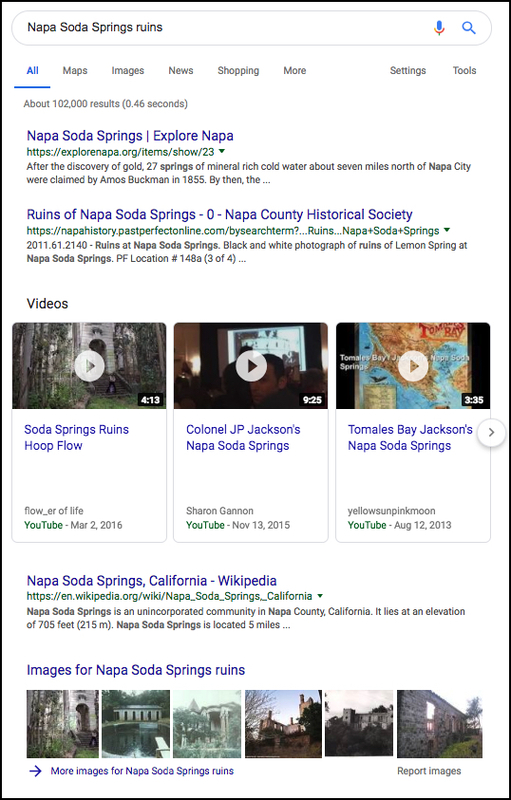 Looking for a bit more context, I searched for "Napa Soda Springs" in both the Library of Congress Chronicling America (archival newspapers collection) and in Google's Newspaper Archive (available under Google Books--click on the "Newspapers" tab under Tools). In both cases I found LOTS of articles from the 1860s onward. In 1888, Napa Soda Springs was still mentioned among the "leading resorts of California" in the Boston Evening Transcript (Oct 8, 1888). 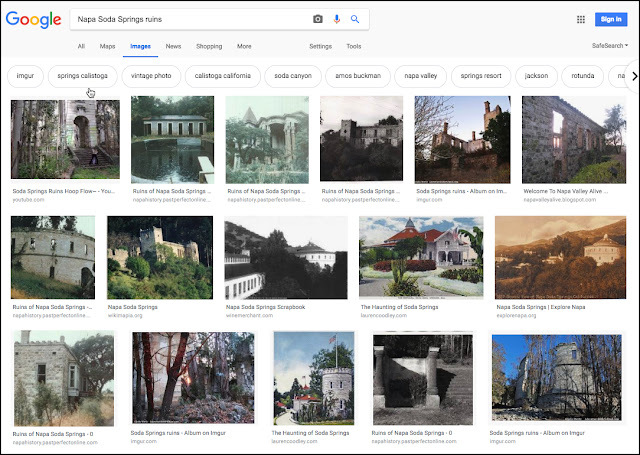 I noticed that doing a search for "Napa Soda Springs" gives lots of results up to about 1890. After that search for "Jackson's Napa Soda" gives more results. While we're at it, what other resources can we find? From that video we can grab a frame that shows the Rotunda as it is now, albeit with a hoop dancer in front. Perhaps the most surprising find (for me) was when I was glancing through the collected Napa Soda Springs images and finding Napa Soda Springs bottles for sale! That made me think of searching on eBay for "Napa Soda." I was really somewhat flabbergasted by what I found... page after page of artifacts from the glory era of Napa Soda Springs--photos, postcards, bottles, crates, and ice picks! I could go on and on with the fascinating story of Napa Soda Springs. There are lots of images and stories out there, but here's the one I like best, showing an overview of the resort in its prime. Courtesy Napa County Historical Society showing the music hall and cottages. And there are stories, such as the time President Benjamin Harrison stayed at the resort which was then owned / operated by John Jackson. Sure, Napa Soda Springs was famous, but enough to attract a sitting president? You have to know that John Jackson worked in the law offices of former Congressman Bellamy Storer.. along with the future President Benjamin Harrison. Forty years later, Harrison would come to visit his longtime friend Jackson at his stylish resort in the hills above the Napa Valley, luxuriating the spring waters. The Napa springs were discovered in 1855, then developed into a fairly famous resort that had extensive grounds and buildings. There were music rooms, a dance floor, a pagoda, spring houses, and buildings including the fabulous Rotunda, 75 feet high with a glass cupola at the top. It was the quintessence of a Victorian-era resort. In the early 1900s it fell into decline, and is now mostly just moody and remote abandoned buildings. The magic isn't gone, but very different than what it once was. 1. Even simple descriptions can work well. Much to my surprise, the obvious queries describing what you could see in the drone video actually led to useful results! Simple is good. 3. Use multiple resources. In this case, both a Map of the area was useful (for the place name "Soda Springs") and the Newspaper archives to give a historical context to the site. 5. Consider other sources than plain Google when dealing with a manufacturer. I was surprised to find Napa Soda bottles for sale on eBay. 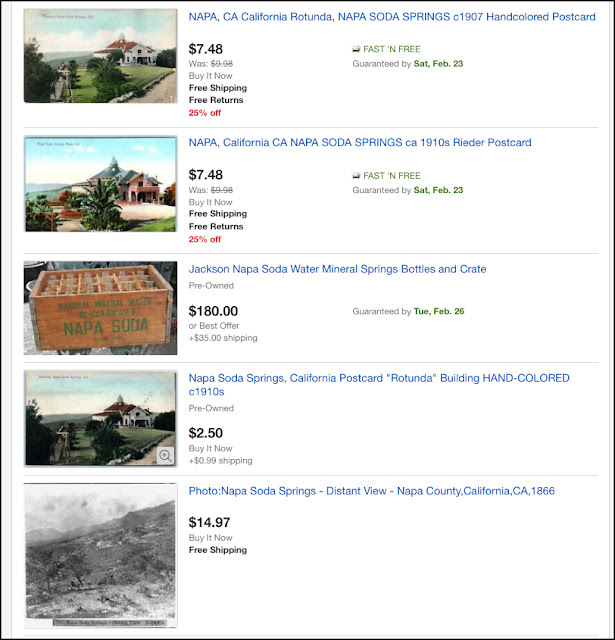 I spotted them first on the Images SERP, but when I started searching, I found hundreds of artifacts and articles (and endless postcards), some with intriguing notes from family members visiting Napa Soda Springs in its heyday. Hope you enjoyed this romp into history.